During an air show on July 1, 1912, a two-seat Bleirot monoplane crashed into the Neponset River. 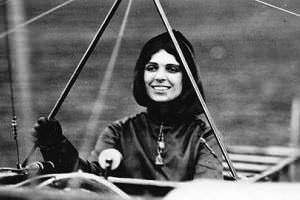 Harriet Quimby, the first woman to earn an American pilot's license, and William Willard, the event's organizer, were tragically killed. The pilot and passenger were ejected from the aircraft due to air turbulence, mechanical problems, or pilot error. An extremely happy atmosphere prevailed that afternoon during the aviation meet. It was almost 7:00 pm when Harriett Quimby took off from Squantum (Quincy) Massachusetts. The aircraft rose to an altitude of about 1000 feet, and gracefully flew over Squantum Head, Thompson's Island, Dorchester Bay, and east to Little Brewster and Boston Light. Aviator Blanche Stuart Scott gained the attention of spectators as she encircled the field while Quimby flew out into the harbor. "Nobody had ever flown to the Light at any such height, and everybody marveled that Miss Quimby should do it. But Miss Quimby said before she started that she would fly high, and she kept her word. Just what her reason for flying so high nobody will ever know. Perhaps her decision was due to the fact that this was about the height at which she flew over the English Channel. She began to descend slowly when she got about over Long Island, and when she was over the field she was about 2000 feet in the air. She made a circle of the field at this height...but she was seen to descend to a still lower altitude when she was passing over Thompson's Island.... When she reached the point where the accident occurred, and when she turned, facing almost due east, as if she were intending to alight in the getaway [runway], she appeared to be about 1000 feet above the earth. 'O, Look,' Cried [the] Crowd In Terror. Clearly it was her intention to land—to make a long glide from the point where she turned to the getaway. She tilted the machine downward at a somewhat acute angle after she had turned. Then it was, when the machine had probably dropped about 200 feet, that Willard was seen to either jump or fall out of the machine. That awful cry went up from those on the getaway and grandstand, which plainly meant terror. It was a quick 'O, look,' from hundreds of voices at the same moment. Then everybody looked and Miss Quimby was seen to fall out of the machine almost immediately after Willard. Women swooned, and men almost fainted on the getaway and in the grandstand. 'My God, they're killed,' came from hundreds of throats, almost simultaneously after the first shock, as the two figures were seen tumbling through the air, followed by the machine." Harriet Quimby and William Willard were killed instantly when they struck the shallow water of the Neponset River between Quincy and Dorchester. The unpiloted aircraft crashed nearby. We must not forget the pioneers of aviation. Accidents similar to this were quite common into the 1920s, and eventually led to the development of the modern four-prong torso harness of today's aircraft. It can be inferred that seatbelts were not used back then because pilots had to quickly escape during emergency landings, and undeveloped seatbelts might hinder such escapes.